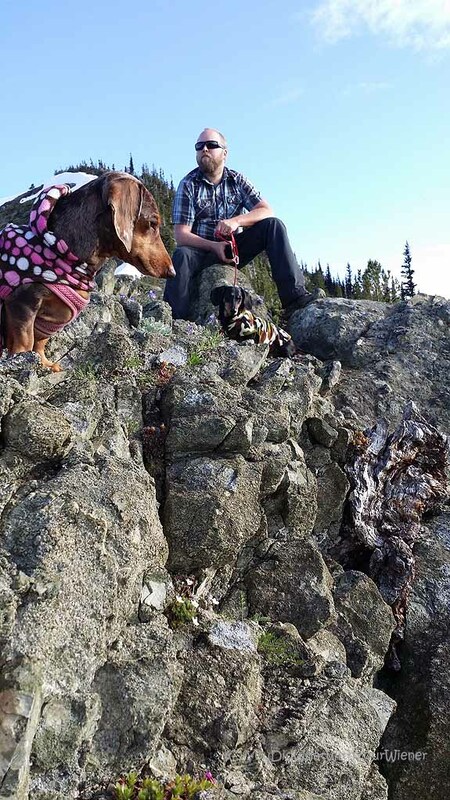 Dogs are not allowed on trails inside Olympic National Park. The Upper Big Quilcene trail is located just outside of the National Park, in the Buckhorn Wilderness, so you can hike it with your dog. The trail leads up to Marmot Pass, which affords one of the best views of the Olympic Mountain range. S and I hiked this trail with Chester before we were married and brought Gretel into our family (and I had started this blog). It was such a great experience. It’s hard to believe that was almost 5 years ago. Yikes! We planned to stay the night at one of the half dozen or so camp sites at Camp Mystery. Although we were hiking up on Sunday, we still weren’t sure there would be campsites available when we got up there (not everyone works Monday through Friday you know). This was a “no timeline” vacation for us so I didn’t pay close attention to the time. We hiked really slow because of the weight we were carrying but I think we still reached Camp Mystery is less than 4 hours. Although the trail was busy, everyone we saw was hiking out, planning to hike past Marmot Pass, or on a day hike. When we arrived at Camp Mystery we had our choice of campsites. Once there, we breathed a sign of relief, unloaded our heavy packs, and set up camp. We hiked the last 3/4 mile up to Marmot Pass in the evening. 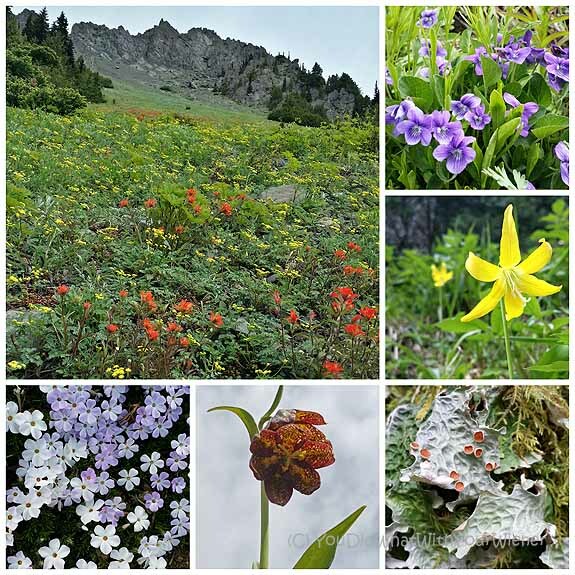 There had been wildflowers blooming in the meadows below Camp Mystery (below) but they were just starting to show in the higher elevation meadow below the pass. There were a few, small, lingering snow patches but they were easily crossed with normal hiking boots. The views at the top of the pass did not disappoint. There were some clouds but most of the Olympic Mountain range was visible. We wandered around to take some photos and then sat on the rocks for a while to relax and take in the view. Suddenly, a mountain goat appeared behind us on the ridge. It was really cool to see that close but the mountain goats can be aggressive. He started moving toward us at a pretty good clip so we headed back down the trail. It seems that we were just in the way of his food because he skirted around us on the lower slope, crossed the trail, and started munching grass. We didn’t want to take any chances so we kept a good distance. After about 10 minutes Chester and Gretel spotted him and Gretel scared him off with her “chirping”. 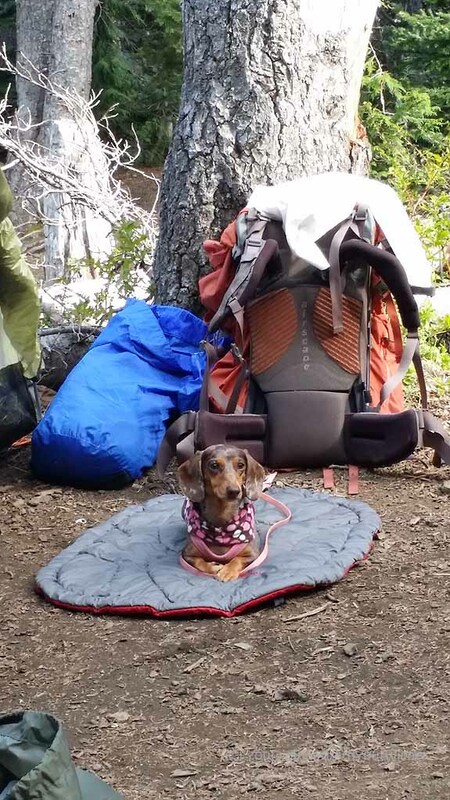 Gretel has gone car camping with us before but this was her first true overnight experience in the woods. She loved it. She stayed very alert to the sounds and smells the whole time. Between the mental stimulation and the hiking, she spent the next day completely passed out on the couch. The Washington Trails Association description of this hike reads: “If for some terrible reason you are only allowed one hike in the Olympics in your lifetime, this should be it. 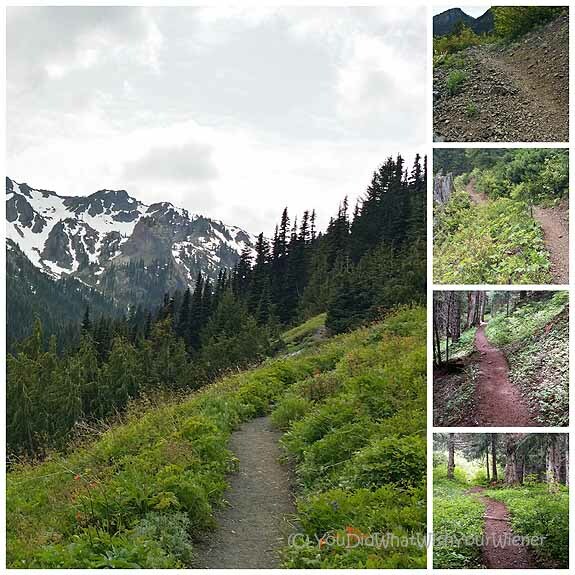 The trail to Marmot Pass captures the very essence of what makes the Olympics so special, and so darned pretty.” Personally, I think this is THE must-hike trail if you are vacationing on the Olympic Peninsula with your dog. The trail starts out easily enough. It gently climbs through a lush, old growth forest, and alongside the beautiful, cascading Big Quilcene river, for the first couple of miles. I would call the next few miles a moderate climb for sure. It would have been challenging even if we weren’t carrying 35 lb backpacks. The hike is still relatively easy though. The trail is smooth except for the few rock scree slopes just before you reach Camp Mystery at mile 4.5. The views are spectacular once you leave the forest so that keeps you distracted from the steady climb. This trail can be done as a long day hike or you can turn it into an overnight camp experience. If you want an easier overnight experience, you can hike approximately 2.6 miles up the trail to Shelter Camp and day hike the remaining 5.5 (round trip) to Marmot Pass and back. 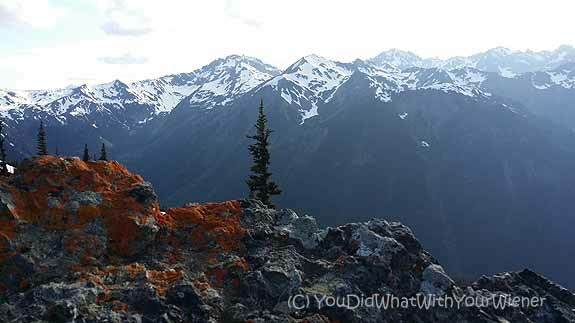 If you choose this option, I would recommend either making this a three-day trip or starting up to Marmot Pass early in the morning so you still have time to pack up camp and hike out the second day. The other option, and the one we chose, is to hike to Camp Mystery approximately 4.5 miles up the trail and camp. With this option, you can hike the last 3/4 mile to Marmot Pass in the evening, or first thing in the morning, and still have time for a leisurely hike out the following day. Chester and Gretel are very eager hikers and can “outlast” me. I’ve noticed, after a long hike they seem unphased by, that they are very tired and it can take them several days to cover. I’ve learned that I heed to make sure they don’t over exert themselves but I am still learning what their limit is. That being said, 4 to 6 hours of hiking (depending on the terrain) in a day is probably as far as I should let them go. We stop for water and at the “top” of wherever we are going for a snack but they don’t need any rests beyond that. 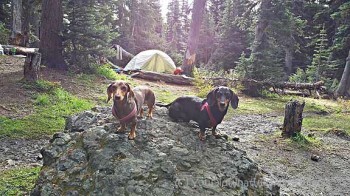 Gretel is young and energetic and Chester has been hiking since a pup though. 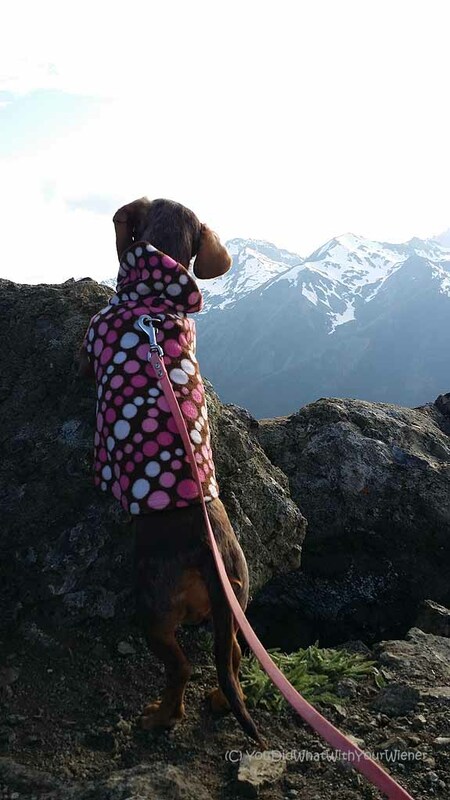 I know several people that have never taken their Doxies hiking, or even really long walks, and they typically have to start with easy 1 – 2 hour hikes. That’s pretty cool and your photos are beautiful. Our hiking is nowhere near what you do and now with Sampson’s injury I don’t see it anytime in our near future. Great images and top website. Very inspiring as well. Longest distance on one day running with my vizsla is approx 21 miles. In 2015 I hope to run the borders abbey way in Schotland. That will be 26 miles a day for three days. Thanks. Chester used to run with me when he was a pup (and I was in better shape) but the most he could go was about 4 miles. He has hiked up to 15 in one day though. Thanks for writing such an awesome blog. 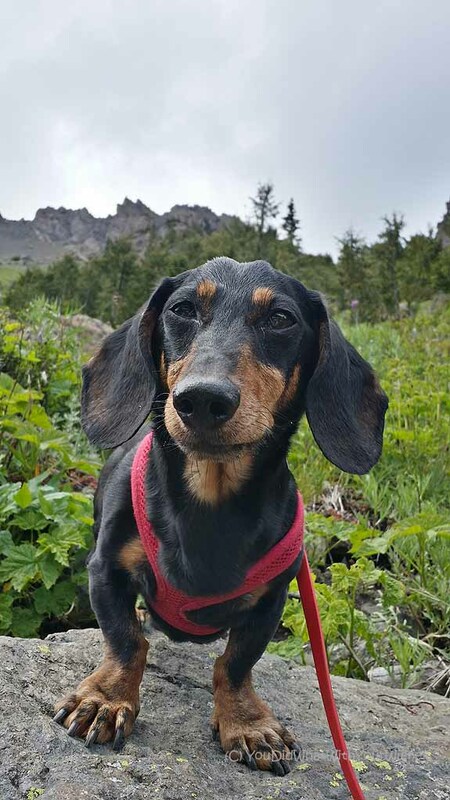 You’re dog friendly hiking information is extremely helpful (especially when you’re new to Seattle). We have a wonderful Shiba companion and want to take her on this trip in a few weeks. Would you be able to tell me what permits are required to backpack overnight? Hi Ashley. Glad you found our blog and think that it is helpful. There are no backpacking permits needed for Marmot Pass but you will need a NW forest Service Pass to park at the trailhead. You can get a day pass for $5 but would need 2 to park overnight. I highly suggest getting the annual pass for $30 since the majority of trailheads in the area require one. Let me know if you have any other questions.